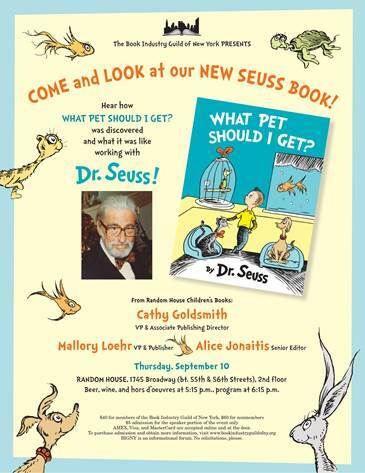 The first fall Book Industry Guild of New York (BIGNY) event is coming up on Thursday, September 10th at Random House (1745 Broadway, 2nd floor), focusing on Dr. Seuss’ new book, What Pet Should I Get? Cathy Goldsmith, Mallory Loehr, and Alice Jonaitis will be speaking about what it was like working with Seuss on his books and how the new book came to be. As always, there is a discount for YPG members. If you register online from the bigny.org website, the Coupon Code: YPGSEUSS will get you 50% off the MEMBER price, making the event only $20 to attend. This includes admission to the networking hour from 5:15 to 6:15pm, complete with free wine, beer, and food. Anyone may attend the presentation (skipping the networking and booze) for only $5. Admission can also be purchased at the door of the event.